An intense battle rages to liberate Mosul from two years of ISIS terror: Nearly 100,000 coalition troops, led by the Iraqi army and including several hundred American military personnel, are pitted against several thousand ISIS militants. The number of those fleeing the conflict has more than doubled since the 1st of November. The latest reports, as of the 9th of November, count over 42,000 displaced people. 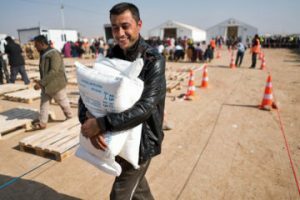 Samaritan’s Purse is distributing food to displaced families at Khazer camp, which lies about 25 miles east of Mosul’s centre. The camp sits just before the border with Kurdish-controlled northern Iraq, along the main Erbil-Mosul highway, and security is tight. The current population of the camp is around 6,000 or 7,000 people and growing daily. On the 7th of November, our national staff and disaster response team members distributed a monthly ration of food to 425 families. 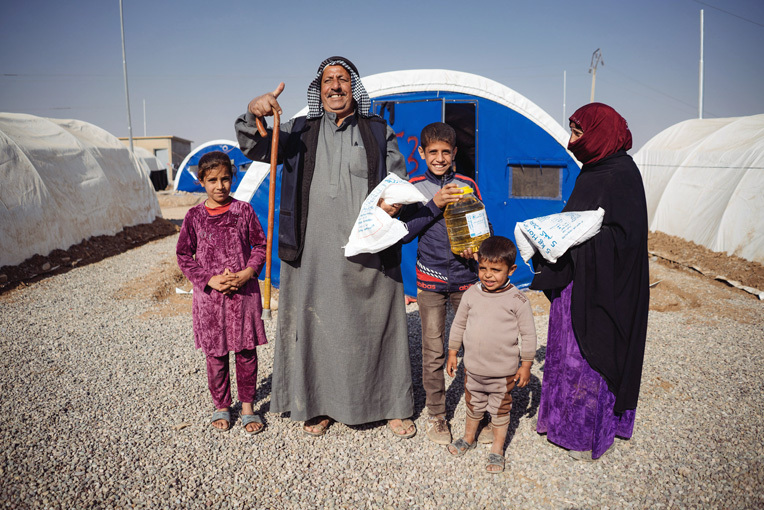 An average Iraqi household includes six members, so that’s an estimated 2,550 men, women, and children who will benefit. Each family unit received flour, oil, chickpeas, salt, sugar, beans, and rice in quantities expected to last 30 days. Distributions continued on the 8th of November for several hundred more families and will continue as long as new arrivals enter the camp complex. We are working in other camps as well and will be helping to meet the food needs of thousands of families over the coming months. Watch video updates from the region. Kasem*, a midde-aged father of eight, was among the first in line to receive food. The family left Gogjali, a suburb of Mosul, a few days ago as fierce fighting reached that area. Kasem’s explanation for why he ended up at the camp was simple. Abdul Rahman*, 62, also received rations for his large family on Monday. He came to the camp recently with his children and grandchildren. When the bombs got close to his Gogjali home, he knew it was time to flee. With the Iraqi military’s help and permission, they were able to drive out of harm’s way. They were eventually stopped at the Khazer camp and have settled in. One of the first things Abdul did after escaping ISIS was shave his beard, a required facial feature under their tyrannical rule. 62-YEAR-OLD ABDUL RAHMAN* WITH SOME OF HIS FAMILY. THEY RECEIVED THE MONTHLY FOOD RATION ON THE 7th NOV. HE ALLOWED SAMARITAN’S PURSE TO PRAY FOR HIM AND HIS ILLNESSES. In the summer of 2014, Abdul and his family lived in a small village just beyond the Khazer bridge (for which the current camp is named). ISIS overran Mosul in June of that year and later stormed east toward Erbil where they met fierce resistance from Kurdish fighters. Abdul’s village was at the edge of the fighting, and ISIS forced his people across the bridge. Then ISIS blew up the bridge and trucked the people west to the edge of Mosul. There they were held hostage until the Iraqi military liberated them over the past week. The drive to liberate Mosul has cleared ISIS fighters from many small villages on the Nineveh plains. These villages, completely drained of their inhabitants in 2014, have begun to repopulate in the past couple of weeks. Families that fled then are now slowly returning to start over. On the 6th of November, Samaritan’s Purse distributed emergency supplies to more than 50 families in two villages. The citizens there are Kakai, a Kurdish people group that adheres to a little known, mystical, and monotheistic religious system that began in 14th-century Iran. They are not considered Muslims, which put them on the ISIS hit list. We were the first organisation to provide relief to these returnees. The families received heavy-duty plastic sheeting to cover windows and doors and otherwise patch up things in light of damage caused by war and ISIS vandals. They also received blankets, kerosene stoves, fuel containers, and three days’ worth of ready-to-eat food – crackers, canned meat, tuna, beans, chickpeas, powdered milk, and dates. The biggest concern that the families expressed was their lack of fuel and electricity in light of the coming winter. ‘ISIS took everything from this village, and the network for city power is destroyed,’ said Kamal, a head of household who received supplies from us. He has a wife and seven children. Twelve-year-old Ahmed is the son of the village leader, Ibrahim. Ibrahim remembers two years ago when his family fled for their lives with only the clothes they were wearing. Now they’re back home, but the village is mostly rubble. Ibrahim said this is actually the third time in four decades that the village has been destroyed by violence. He hopes things will change. 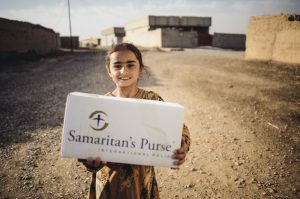 Read up to date news of how Samaritan’s Purse are helping. Thousands of Iraqi believers need our help to repair houses that were left in ruins by ISIS terrorists. Many of these houses can be fixed up for less than £2,600. Your gift will help a Christian family return to the Nineveh Plains, where they can be a light for the gospel in the heart of the Middle East.